A key challenge faced by auto lenders, such as Toyota Financial Services, is how to treat a customer who is in short- to medium-term financial difficulty. Striking the right balance between maintaining the future relationship and protecting the business from financial loss is critical. Helping customers remain customers is possibly the best way to secure lifetime profitable loyalty and business growth. 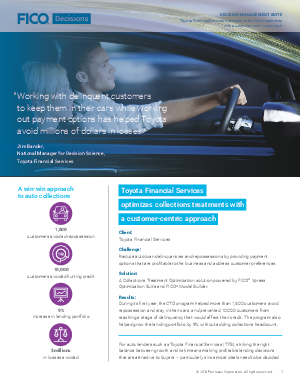 Download the case study to learn how Toyota Finance applied analytic optimisation to collections treatments and helped their customers stay in their cars. Challenge: Reduce auto loan delinquencies and repossessions while improving customer retention. Solution: A customer-centric Collections Treatment Optimisation solution powered by FICO. Results: During its first year, the program helped more than 1,600 customers avoid repossession and stay in their cars and prevented 10,000 customers from reaching a stage of delinquency that would affect their credit rating. The program also helped grow the lending portfolio by 9% without adding collections headcount.